Founded in 1888, classic Swiss watch Manufacturer Jean d’Eve combines traditional watch craftsmanship, creativity and aesthetics. The aim is to create timeless art pieces with a unique point of view and individuality. At Baselworld 2010, Jean d’Eve showcased her first Tourbillon Classic Collection, which indicates a new apex in watch craftsmanship. This new collection features 18K gold and 18K pink gold round cases housing tourbillon movements and are fitted with brown or black crocodile leather straps to provide an attractive watch that embodies simplicity and classic design. Its white or black dials with Roman numerals as hour markers, are decorated with a Clous de Paris pattern. A window on the dial, opened at the 6 o’clock position, unveils the heart of the watch movement – the Tourbillon. The movement of the lever escapement and balance spring can thus be clearly observed. The second hand is directly linked to the tourbillon which completes a full rotation every 60-seconds. The 32-jewel movement is also visible through the transparent case back. 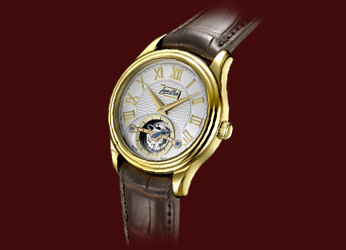 Tourbillon Classic Collection (Limited Edition) quality watch is a “must-have” collectible.